Homemade Tub Cleaner! Easy and Inexpensive!! I live in Georgia. Georgia has red dirt. Stubborn red dirt! It stains our feet which in turn stain the bottom of our tubs and showers. I hate using really abrasive cleaners. I’m afraid that they will scratch up my tubs. 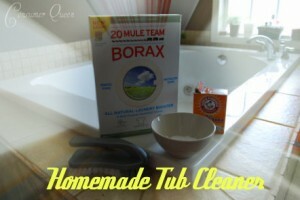 This homemade tub cleaner recipe is easy and only costs pennies. Mix 4 parts baking soda with 1 part borax. That’s it! Mix together. Sprinkle on the tub. Get a little wet. SCRUB! And rinse clean. Borax can be found int he laundry section. It costs about $3-$4 for a box. A box will last you a long time!! Will try this one!!!! Great idea. Thanks JoAnn feel free to share with your friends.